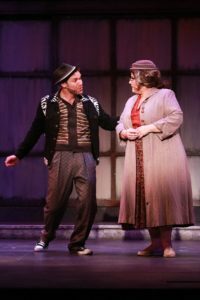 Huey (Eddie Egan) and his mother (Margot Moreland) argue in a scene from Actors’ Playhouse’ production of Memphis: The Musical. 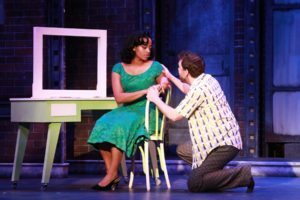 CORAL GABLES, Fla. — About a year ago, Ft. Lauderdale-based Slow Burn Theatre mounted a dynamic production of the highly-charged, Tony-winning musical, Memphis. Today, about 32 miles south of Slow Burn’s home, Actors’ Playhouse at the Miracle Theatre is staging an equally electric, pulsating production of this multi-layered musical. Actors’ version, running through April 7, features fireworks. There is high-octane, acrobatic dancing, believable performances and soulful, spirited singing. The performers’ voices are versatile, strong and emotive. Actors’ Playhouse is a multi-award-winning, highly-respected Coral Gables professional company. In particular, its work on musicals has garnered many awards. Memphis’ cast comprises a mix of South Florida and New York triple threats. Also, the company comprises regional theater performers and a member of Memphis’ national tour. The latter is a vivacious Jerrial T. Young as Bobby. Not surprisingly, this urgent and timely show is receiving multiple productions around the country. Theater companies have scheduled mountings through next year. Memphis won multiple Tony Awards relatively recently, in 2010. However, the musical is quickly becoming a classic. Certainly, its themes have the capacity to speak to multiple generations, past, present and future. The musical touches on, among other topics, racism, prejudice, ambition, as well as the ability of music to unite and heal. In addition, the power of sincere, mutual love (however forbidden) is central in this show. It tells an intimate, heartfelt story inspired by the true tale of pioneering late 40’s/early 50’s DJ Dewey Phillips. He played the music of black and white artists for an integrated audience. In Memphis, the eccentrically lovable, white DJ, Huey Calhoun, shocks all by playing black music for people of both skin colors. The famed Tennessee city is the self-proclaimed birthplace of rock ‘n’ roll. Specifically, the musical takes place in the 1950’s “underground” seedy nightclubs, radio stations and recording studios playing race music. The two-level set, by scenic designer Tim Bennett and lit by Eric Nelson to evoke appropriate moods, is symbolically significant. There are few glimpses into the outside world amid the dusty, mud-stained brick structures. It’s as though these dark, decadent places are operating in secret. Perhaps, the owners fear that white folks will storm these places and chaos will ensue. Certainly, these are not unreasonable concerns. At Delray’s, a party is in high gear. African American men and women are apparently having a great time. That is, until an awkward, seemingly unsteady little man, (Huey) stumbles in. He claims that the songs they’re playing represent “The Music of My Soul.” Naturally, tension arises. The uncomfortable air is palpable in this production. The show’s creators, Joe DiPietro (book and lyrics) as well as David Bryan (music and lyrics) waste little time in establishing the inciting incident. Namely, Huey sets his eyes on club owner Delray’s younger sister, Felicia. With that, the strong central conflict is firmly in place. Huey is idealistic, many might say naïve and committed to changing the world by playing race music for whites and blacks. On the other hand, Delray is realistic and fiercely protective of his younger sister. Never mind Huey’s lofty, noble ideals. Delray will protect his baby sister at all costs from repercussions stemming from an interracial relationship. After all, authorities forbade it at the time. Meanwhile, others highly frowned upon such a pairing. However, when a character desires something so strongly, riveting drama results. And don’t be fooled by appearances. True, Huey appears to be an easy pushover. This illiterate man (whom Eddie Egan expertly portrays) is on the small side. He speaks in a sing-songy voice and walks awkwardly. His posture tilts at a slight angle. But appearances are just that. Undoubtedly, fire rages inside him. Egan’s Huey will not let smug, white and obviously prejudiced music industry representatives push him around. But what happens when one’s roots, ambition as well as the prospects of fame and fortune collide with supposedly sincere, till-death-do-us-part love? Huey must confront these forces. That’s because New York City music stations soon try to recruit him and Felicia. Does he join her or remain behind in his beloved hometown of Memphis? No question, the musical’s songs capture the time period and mostly reveal character. But how strong of an argument does “Memphis Lives in Me” make? Does it convince us that, for Huey, Memphis is more important than Felicia? In this renowned city, the blues may “sing softly in the air, like a Sunday morning prayer.” But, surely Huey would bring that sound to the Big Apple. After all, he has a famous show featuring black music and dancers. And Felicia would remain by his side. The quiet, contemplative song’s lyrics fail to convince us that to Huey, home is more important than the woman he loves. Ironically, Huey’s mission revolves around change. Yet, as tough as change might be, he won’t embark on a new journey, even for Felicia. To be sure, Huey is a sympathetic, likable character. However, the aforementioned song lessens these traits a bit. But this is hardly Egan’s fault. His Huey is sweet but not sentimental, confident without seeming arrogant and sensitive without conveying self-pity after Felicia chooses to pursue her dreams in New York. In fact, Egan’s voice betrays urgency and determination when Huey begs Felicia to reconsider. His sincere pleading will surely win you over. Meanwhile, Egan’s Huey bares his soul with his versatile, expressive singing voice. As embodied by Egan, there’s music not just in Huey’s soul and voice, but in every move. Each step, each gesture seems to be a dance move or musical gesture. And when he punctuates a comment by pointing, it’s as though he’s gesturing toward a bright future which he can somehow see. Opposite Egan, Gabrielle Graham shines as Felicia. She’s a belter. However, her strong, often high-pitched voice is hardly screechy or unpleasant. Rather, her sometimes honeyed voice caresses us. During other times, her strong pipes wow us with their power and ability to convey sincere emotion. At all times, this performer, making her professional debut in a leading role, owns the stage while singing. She appears as comfortable as though she were taking a hot shower. Acting wise, Graham invests Felicia with a modesty and wariness that makes us root for her. Graham also finds Felicia’s tender side. This is especially true after the character has grown comfortable with Huey. Under David Arisco’s thoughtful direction, the couple seem to genuinely love each other. Arisco creates touching stage pictures and his directorial choices help to illustrate how close they’ve grown. But as loving as Felicia can be, some may say she’s naïve. And so, her older brother, Delray, feels the need to protect her. As Delray, Chaz Rose is nothing short of a fierce, menacing watchdog in attack mode when Huey inches too close to Felicia. At one point, you really feel he’d kill the little man if others didn’t restrain him. Rose clearly conveys Delray’s protective instincts through the song, “She’s My Sister,” even if the lyrics aren’t terribly expressive or original. Composer Bryan, with whom people are perhaps best familiar as the founding member of the rock band Bon Jovi, has created a varied score. But the most powerful song is “Say a Prayer,” which a character named Gator (David Berry) sings. Up until then, he hadn’t uttered a word, for a reason that should shock you. But when he opens his mouth, his voice emits a hopeful, soulful sound. It drifts across the stage and out into the auditorium. Berry’s voice is filled with such hope and heart that it is a production highlight. The lyrics to “Say a Prayer” resonate especially painfully, but truthfully today. Say a prayer that hope is ’round the bend. In fact, even Huey’s previously prejudiced mother (a severe, unbending and commanding Margot Moreland) becomes more open and accepting of others. One scene which touchingly communicates acceptance, tolerance and unity involves black and white youth, portrayed by ensemble members, are playing a game. It’s heartwarming. While this production is generally strong, it’s curious as to why Arisco has decided to show the actors on a projection screen during the filming of Huey’s TV show. Do we really need to seem them onstage and on screen, doing the same thing? If anything, it’s distracting. Our eyes don’t know where to look. On the other hand, it’s impossible not to look at Huey’s unorthodox clothing (Ellis Tillman designed the character-defining costumes). Huey’s outfits hardly match. When Felicia, in one of the show’s lighter moments, tells Huey he needs a woman besides his mama to pick out his clothes, you laugh and nod in agreement. While many people attend musicals to escape life, Memphis will make you at least ponder its painful truths. But this show also offers a rousing good time – and that’s especially true with Actors’ Playhouse’ electric production. Memphis runs through April 7 at Actors Playhouse at the Miracle Theatre, 280 Miracle Mile in Coral Gables. Tickets range from $30 to $75, with discounts available. Show times are 8 p.m. Wednesday through Saturday, as well as 3 p.m. Sunday. For more information, call (305) 444-9293 or visit www.actorsplayhouse.org. Huey (Eddie Egan) and Felicia (Gabrielle Graham) share an emotional moment in Memphis. Area Stage Company’s vibrant ‘Cabaret’ speaks to our times, implicates us.